After a couple of days in Athens, I headed to Skiathos to meet Amy and her two friends. Amy lives in London and is originally from South Africa. I met her in 2011 during my first trip to Europe. We kept in touch and I saw her again when I was in London in 2012. The hotel we stayed at in Skiathos was just outside of town and had many beautiful flowers, grapevines and olive trees on the property. There was a wonderful college aged girl, Vanessa, working at the hotel. She was on the island for the summer and didn’t know many people. We invited her to go to the beach with us on the first day (she worked late afternoons and evenings) and she became part of our group for the remainder of our time in Skiathos, as shown in the photos below. Meeting new people from different places is my favorite part of traveling. We spent most of our time in Skiathos at the beach and exploring the town. We also did a boat trip to other islands nearby one day. The highlight of the boat trip was the island where the “Mamma Mia” movie was filmed. We got to stop on the island and visit the church where ultimately, Meryl Streep and Pierce Bronson’s characters were married. After several days in Skiathos, I ventured on to Mykonos. Mykonos is very beautiful! There was a great photo opp everywhere I looked. It was so great to set out and explore the island with no intended destination. One of the things I was most surprised about in Mykonos was how windy it was. At night in my hotel room, it sounded like a Midwestern blizzard was brewing outside. On my last day in Mykonoes, the wind ended up being a problem because it forced them to keep delaying the ferry I was supposed to take to Santorini. They finally canceled all ferries so I had to scramble around at 11pm to find a last minute hotel room. Hotel rooms were hard to come by since it was busy season so I considered myself very lucky. I should have held that thought because I overslept the next morning and missed the 5:30am rescheduled ferry. While Mykonos is very beautiful and I was so lucky to be there, I was getting tired of being stuck on the island by that point. Dragging my luggage around while trying to find the ferry docks and a hotel was starting to take its toll on me. I decided at that point that if I wasn’t on a ferry heading to Santorini by noon, I was booking a flight back to Athens and spending the rest of my trip there. Upon arriving at the port where the ferries departed (after oversleeping), I found out the next ferry to Santorini departed at 10:30am…but was fully booked. I decided to stick around the port to see if anyone canceled and realized after the ferry arrived that it was a situation where you got on and showed tickets later. So I got on, figuring they wouldn’t toss me into the sea en route. The risk was worth it. The ticket taker wasn’t too pleased about me not having a ticket for that particular ferry (I had tickets for several ferries from the day before) but I talked so much trying to plead my case that I think he just wanted me to go away so he told me to pick any available seat and let me go. Whew! The ferry ride to Santorini took several hours. On the ferry, I met a wonderful woman from Ukraine who was also traveling alone. It worked out well because we were able to save each other’s seats and watch each other’s stuff when we needed to get up and walk around or go to the restroom. Once in Oia, Santorini, we checked into our respective hotels and then met up to explore the island together. It was so nice to have someone to take photos for me (and vice versa) and we also had dinner together. Any meal I don’t have to eat alone while traveling alone is a bonus. 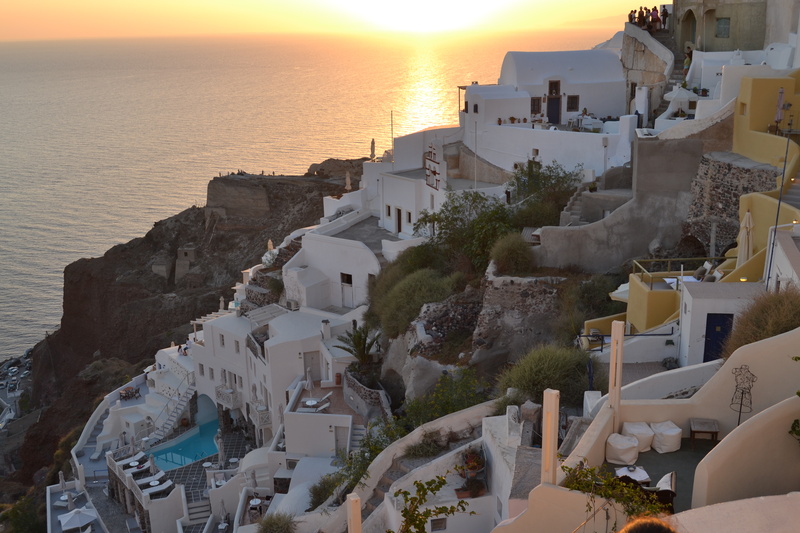 One of the main attractions in Oia is the sunset. People arrived in droves on buses from other parts of the island to see it and it was a bit overwhelming. I scoped out my spot early and as I was backing up to let someone past while waiting, my finger hit a metal piece in the wall behind me. Next thing I know, my finger is bleeding profusely. I borrowed some napkins from a restaurant and was offered tissues and bandages in four different languages from people around me. It restores faith in mankind when people are so concerned and helpful (of course my mini first aid kit was in my suitcase at the hotel). I managed to get my finger to stop bleeding and bandaged without getting any blood on my white shorts and enjoyed the sunset. I spent the next day exploring more of the island and relaxing by the hotel pool to avoid the massive crowds before heading back to Athens and then flying home.